Okay, honesty moment: How often do you get stressed? Don't you wish you could snap your fingers and your stress would magically go away? Same—but we're human, which means stress feels inevitable at times. According to a survey done by The American Institute of Stress involving a total of 800,000 workers in over 300 companies, the number of employees calling in sick because of stress tripled from 1996 to 2000. To make matters worse, an estimated one million workers are absent every day due to stress. Thankfully, thoughtful brands like Care/of are creating innovative, science-backed supplements made to save us when the going gets tough. Care/of specializes in personalized vitamins for its consumers, but a few months ago, the brand released vitamin-packed Quick Sticks that target various health concerns. The mini packets contain a melt-in-your-powder that helps with things like immunity, digestion, sleep, and energy. To complete the collection, today the brand released the final stick that combats stress. It's called Chill Factor, aka a literal chill pill. Basically, it's what dreams are made of. This to-go supplement is made of GABA (gamma-aminobutyric acid), which is clinically proven to help regulate your body's response to stress. GABA is the real deal and Byrdie caught wind of how essential this is for sleep, stress, and overall happiness levels a while ago. GABA is a chemical compound in your brain, and studies show it helps to relax your body as well as your mind. Generally, the more GABA you have in your brain, the more mentally and physically relaxed you'll be. In fact, being GABA-deficient can lead to stress and insomnia. Arguably the best thing about this stuff is its sweet-and-tangy lemonade taste. It's also made of chamomile extract, lemon balm extract, and passion flower, which together help soothe your mind of stress. "We hear from customers often that they're looking for ways to manage their stress—it's something I think pretty much everyone can relate to," Craig Elbert, co-founder and CEO of Care/of told Byrdie. 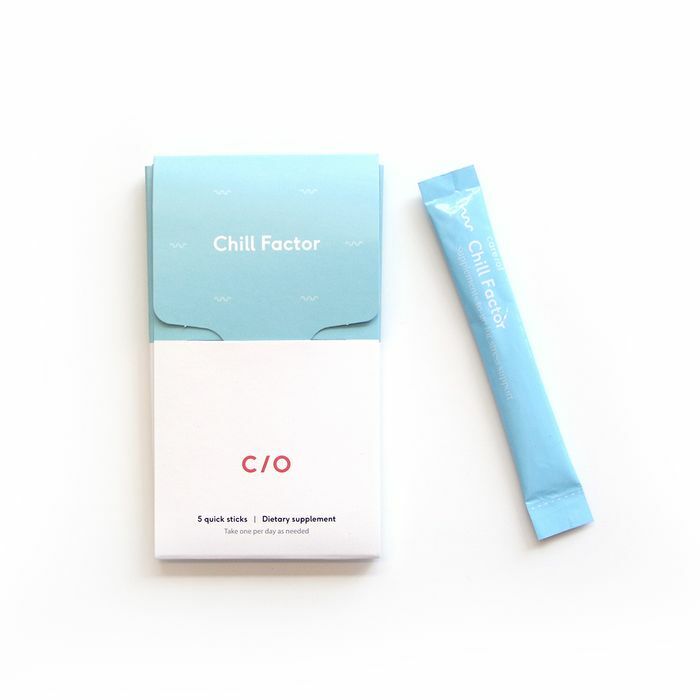 "So we're excited to launch Chill Factor. It was important to us to develop a formulation supported by research. GABA is one of the primary ingredients in Chill Factor and is one of the major inhibitory neurotransmitters in the central nervous system. GABA supports relaxation but can be depleted in stressful situations. The research behind GABA is emerging but promising, and we think it can be a great tool in helping to manage stress." For just $5 you can get five of these chill sticks, available online today. We're obsessed with the idea of living with less stress and better sleep. To hold you over while you wait for these to ship, shop the below sleep-inducing products for some well-deserved R&R. Here's to less stress and extra zen!